Chelsea very nearly scored what would have been the goal of the season in their 4-1 victory against Cardiff yesterday afternoon. The above move is a perfect example to Chelsea fans that Sarri-ball is in full swing. 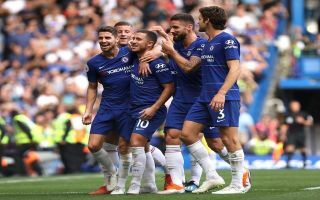 David Luiz started the move with an exceptional pass forward from defence into Pedro who flicked the ball into Giroud who then back-heeled to superstar Eden Hazard who was denied by Cardiff shot stopper Neil Etheridge. Chelsea are enjoying life under Maurizio Sarri so far with the side sitting 1st place in the Premier League, winning all 5 of their games this season.